Commissioned for the 1st Tatton Park Bienale, The Walking Ferns are a herd of solar-powered fern like sculptures, designed for installation in the Victorian Rose Garden pool at the historic Tatton Park. The Victorian' love of ferns resulted in something of a craze - Paxton's Fernery houses a collection brought from the rainforests of New Zealand and the introduction of the plant into homes signalled a new era. No longer confined simply to glasshouses, plants were to be grown indoors where previously only cut flowers would have been deemed appropriate or desirable. However, as interest in the fern grew, the hunting of specimens brought many to the brink of extinction. Over-hunting suggests both the gluttony of human consumption and the possibility of the plant's attempt to avoid capture. This sculpture is based on the Walking Fern, or Asplenium rhizophyllum, which throws down its fronds, to take root in the soil. This action can be endlessly repeated, allowing the plant to relocate as soil conditions dictate. 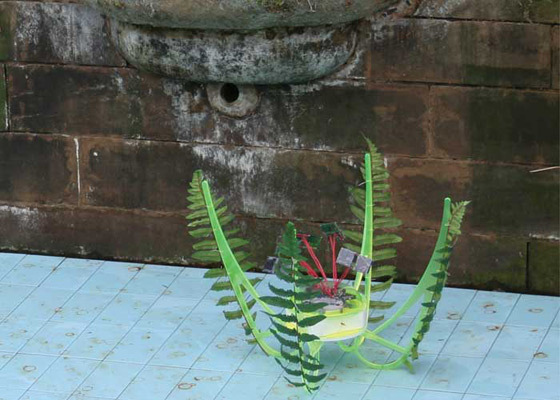 The sculptures, a herd of solar-powered ‘fern-bots’, are presented in the drained bath of the Rose Garden. Trapped by the architecture, they plod along the tiles, searching for suitable conditions in which to survive. Phillips describes her interest in taking up the agency of plants, recognising the possibility that flora possess self-determination, as witnessed by the solar-driven ‘monster’ that moves at will.